This post to present you the second part of the #TunneyWeek Birthday Project for Robin! 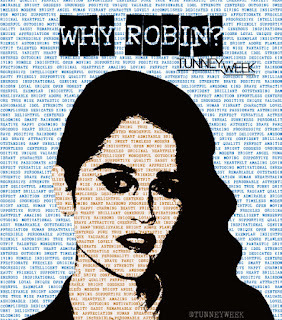 On the first day of the #TunneyWeek, June 12, we’d like you all to answer this question: Why Robin? Why did you become a fan of Robin? What drew you to her in the first place? What do you like the most about her? Share your answers on every social media you like to use: Twitter, Tumblr, Instagram, and posting to our Facebook Event. If you share your thoughts on Twitter, Tumblr and Instagram, don’t forget to use these tags in your post: #TunneyWeek and #WhyRobin - Why is this important? Because we will collect all your entries during this day, we will put them together, and we will create a document that will go together with the first part of our Birthday Project. We will then tweet this document to Robin on the day of her Birthday. Think about what you’d like to write, and be ready for June 12!! You don’t have any social media profile but would like to participate? No problem! Just send an email with your thoughts to tunneyweek1[at]gmail.com (deadline: June 12). These two projects together will give a chance to every single fan to participate and create a special present for Robin. Thank you to a Tunnie who, with their entry to our survey, has given the idea for the “Why Robin?” Day! #TunneyWeek: Our Third Year Together! The #TunneyWeek starts this Sunday!